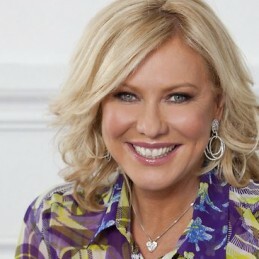 Kerri-Anne Kennerley is one of Australia’s most iconic media personalities and has been a favourite with Australian television audiences for more than 30 years, Since her first appearance on television in 1963. She has worked in a variety of different roles in the entertainment industry, from cabaret singer to radio station CEO. Born in Sandgate, a working class suburb of Brisbane, Kerri-Anne was brought up in a hard-working family with a strong work ethic, which she believes has helped her overcome the “speed bumps” which occur in everyone’s life from time to time. Kerri-Anne wanted to perform for as long as she can remember and singing in a local group led to her first TV appearance on kids’ television show ‘Everybody In’ at the tender age of 13. Her persistence resulted in a job co-hosting the program. After then moving to Network Ten to host ‘The Saturday Show’ for three years, Kerri-Anne went solo, touring the world as a cabaret singer. She lived and worked in New York for several years, where she met her husband, John Kennerley. Following a brief period acting in Aussie soap ‘The Restless Years’, Kerri-Anne secured a job as the presenter of ‘Good Morning Australia’. She co-hosted the show for 11 years and became a household name. When GMA finished, Kerri-Anne achieved her long time ambition to host ‘Midday’, which became the most watched daytime program in Australia and landed her a Gold Logie nomination. In 1999 Kerri-Anne joined ‘What’s Cooking’ and returned to the Nine Network to then host ‘Mornings with Kerri-Anne’ from 2002 to 2011, combining her love of fabulous frocks and shoes with irreverent interviews with Australia’s VIP’s, bringing a caring attitude to the issues facing her audience. Kerri-Anne has since signed with Channel Seven for several projects including appearing on the top rating ‘Dancing with the Stars’. Away from the spotlight, Kerri-Anne is a successful businesswoman and tireless charity worker. She has served on the Council for the Order of Australia and was proud to help give honours to great Australians. Kerri-Anne Kennerley is a survivor. She has negotiated changes in her career with style, dignity and hard work and has encompassed over three decades of news, lifestyle and variety programming with equal aplomb. A complete and enduring professional, Kerri-Anne Kennerly is endeared by Australian audiences across all generations.